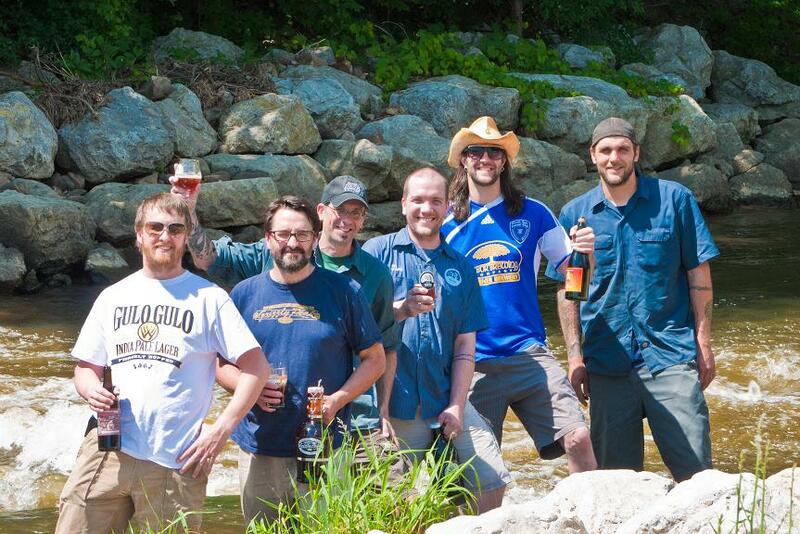 BREWIN' ON THE RIVER: (L to R) Oliver Roberts (Wolverine), Duncan Williams (Grizzly Peak), Ron Jeffries (Jolly Pumpkin), Tim Schmidt (Blue Tractor), Dannyboy Peron (Corner Brewery), Bill Gerds (Arbor Brewing). Photo courtesy of the Huron River Watershed Council. Lately I've taken to watching all these nerdy space shows on Discovery, National Geographic, the Science Channel, and so on – everything from the origin of the universe to the nature of time to the formation of the Earth. One such show posited that at least some of our planet's water originally came here via comets and asteroids and stuff. Far out, man. It makes a lot of sense, then, that Ann Arbor's breweries have joined with the Huron River Watershed Council (HRWC) for "Brew for the River," a series of beer-related fundraising events beginning this Thursday and continuing every Thursday until HRWC's annual "Suds on the River" bash on September 15. Proceeds from all the events go to help the HRWC in its work of preservation and education. "We've been involved in Suds on the River since it first began four or five years ago," said Duncan Williams, head brewer at Grizzly Peak Brewing Co. "Water quality is very important for beer, so brewers teaming up with HRWC was a natural fit." Those brewers and breweries include Williams, Oliver Roberts of Wolverine State Brewing Co., Ron Jeffries of Jolly Pumpkin Artisan Ales, Bill Gerds of Arbor Brewing Co., and Tim Schmidt of Blue Tractor BBQ & Brewery. "Great beer, safe drinking water, and amazing recreational opportunities are just a few of the many benefits of living on and getting our water from the cleanest urban river in Michigan," said Rene Greff, co-owner of Arbor and Ypsilanti's Corner Brewery. "Most of the credit for this fact is owed to the efforts of the HRWC over the past five decades, and we've been happy to be participating sponsors since the first Suds." Williams concurs with Greff's assessment, noting "Because of the HRWC, the watershed is in much better shape than it was 10 or 15 years ago." To honor the occasion, he's created Watershed Ale, a beer brewed with Bee Balm, Yarrow, and other herbs that are indigenous to our area. Other special beers include Arbor's Blackberry Blonde, Jolly Pumpkin's Hummocky Lick Sumac Sensation, and Blue Tractor's Huron River Celebration. The kickoff event takes place tomorrow evening at the Wolverine tap room, 2019 W. Stadium, beginning with a free pizza buffet at 5 p.m. and including live music from local faves Dragon Wagon and beer specials all night long. If you go, be sure to pick up your "Brew Passport," which will, when stamped at all subsequent "Brew for the River" events, make you eligible to win a great prize: free beer. That's right, you'll be entitled to two free growler fills from each of the five breweries. Second prize is line-jumping all Jolly Pumpkin special beer releases for a year. The drawing take place September 8 at Blue Tractor. For the full schedule of events, visit the HRWC website. And if you're interested in getting tickets for the September 15 "Suds on the River" bash, see here.